Yes! I am down 10 pounds on my back. 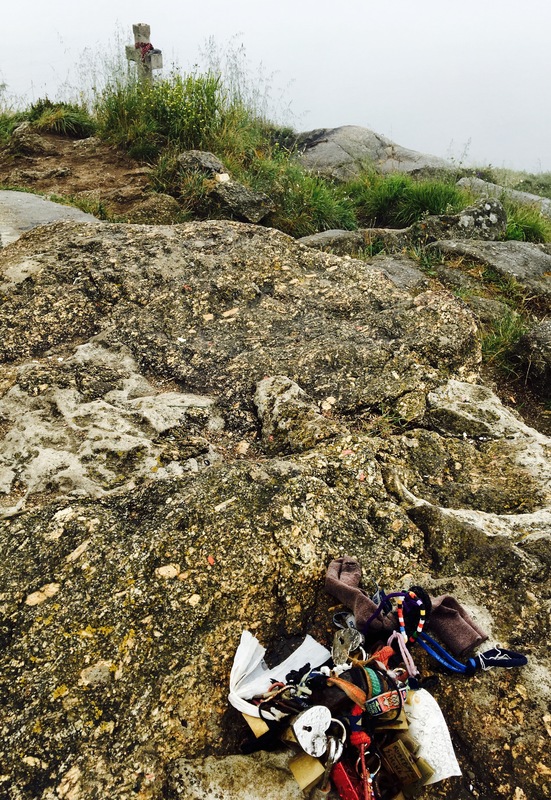 Here’s the picture of all the gear that I carried for the last 5 days of my 1 month, 250 mile ” backpacking” trip on the Camino Portugese this past June. I started this trip with fourteen pounds of gear. 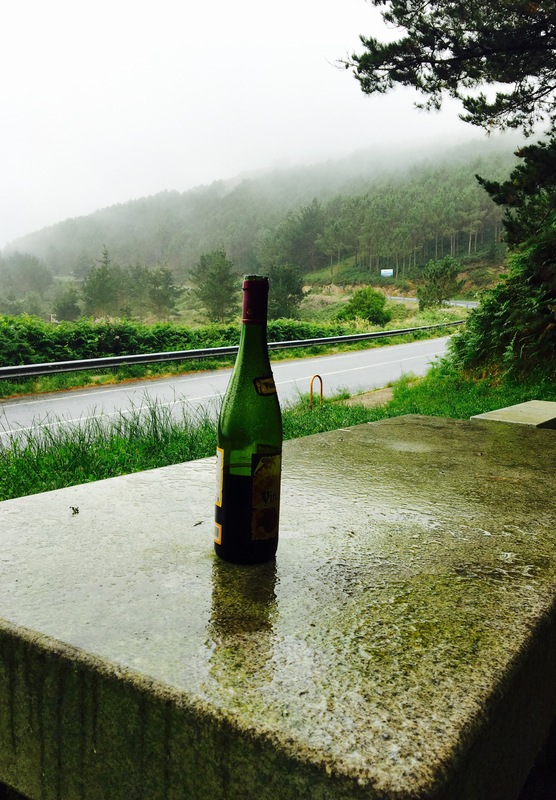 I was able to experiment with ditching numerous items for the last 5 day of the walk in Spain, at a distance of some 50 miles from Santiago de Compostela to Finisterre. It was the perfect time to experiment with a minimally-prepared pack. Ditching gear for this leg of the journey was not my idea. It was suggested to me by the “Irish Hiking Machine”, AKA David Rooney, an important contact that I spoke with for just one hour on my pilgrimage. After we parted ways I never saw Rooney again. 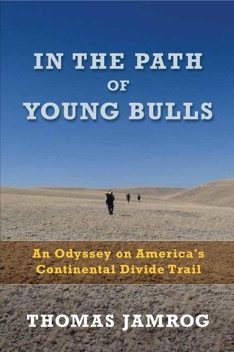 Rooney was a three time repeat on the Portugese Camino, and knew the ropes. At the albergue where we both had bunks, Rooney made a call ahead to his favorite hostel in Finisterre, the Cabo de Vila , where he helped arrange a private room for Marcia and I. At his suggestion, we also booked an extra night there, in order to relax and enjoy the area. Rooney encouraged us to further even plan ahead and reserve a night for when we take the bus back, returning from Finisterre to Santiago. We liked our room, and it was near the bus station, so we planned a return to the Hotel Cuidad de Compostela (49.09 Euros), where we spent our last night before moving on to walk the “Camino Finisterre“. Rooney’s reasoning was to leave any extra items from our packs at the hotel, where we’d be back in 5 days. The Hotel was very accommodating to this plan. Even a fourteen pound pack has things one may not really need, and I decided to be ruthless about reducing weight. I left my summer down sleeping bag at the motel. Sleeping pajama style in my thin merino wool tights and long sleeve jersey worked fine. If I was not warm enough I was able to throw a blanket over myself. Our lodging places had extra blankets in the rooms. It’s been perfect weather here in June, with just two successive days in the month bringing light intermittent rain, and with the five day forecast for clear skies, I left my warm jacket, rain jacket, and rain skirt behind as well. Other extra items were souvenirs, pamphlets, guidebooks, a Portugese phrase book, and maps we didn’t need any more but wanted to keep. So how did it work out for me with just 10 pounds on my back? The bottom line was that I didn’t miss a thing. I had no spare clothes, but it was so warm and sunny during the day that I was able to wash out my shirt and underwear each day, and easily dry them on a laundry line out in the warm sun that lingered here past 10 pm each night. I’m inspired to keep my weight down when I return to backpacking at home as well. It’s a welcome experience with 10-15 pounds on your back, however, the move requires trusting that things will work out, or that it won’t be so bad if I’m lacking something that I might have brought along. Backpack – Granite Gear —-Leopard AC 58 49 oz. 1 Pack cover 3 oz. 1 headlamp w/ batteries 2.1 oz. 1 pr. wool shortie socks 2.6 oz. 1 wool midweight long sleeve hoodie 9.4 oz. Patagonia Houdini wind jacket 4.3 oz. 1 pr. New Balance Minimus shoes 9.1 oz. 1 1-liter Platypus 1.5 oz. 1 iPhone with headphones, wall charger and cable 6.6 oz. 1 Anker Charger 5.8 oz..
Europe Electrical converter box 6.6 oz. 1 Wahoo Ticker heart rate monitor 2.0 oz. Write in the Rain notebook 1.5 oz. Montbell “chrome dome” umbrella 5.8 oz. Checkbook w/ credit card ( stripped) 3.0 oz. In September of 2013, I walked away from the treadmill at my local YMCA where I had been a faithful member for decades. An 18 mile round trip Camden and back to walk indoors on a mechanical device with all these TV screens on the wall in front of me blaring trivia and shock news seemed wrong. Instead, I now walk or ride one of my bikes for 75 minutes almost every day. I also tend my vegetable gardens. The best souvenir that I‘ve brought back from the Portuguese Camino is not my small wheel of aged Galatian cheese, my tiny espresso cup/saucer, my scallop shell/cross tattoo, or my wool cap. It’s this picture. It was taken along the coast of Portugal on my first day on my month long hike. It’s one of many hundreds of small summer family vegetable gardens that are the norm in this part of the world. All the basics are covered: lettuce, onions, potatoes, tomatoes, peppers, green beans, and the almighty collard green- looking like a morphed cabbage plant that also serves double duty as a parasol. These gardens sometimes are paired with a few chickens, in one of the planet’s mutually beneficent relationships. The chickens eat the weeds, garden trimmings, and consume bugs, with the garden receiving nutrition from chicken manure. That picture has framed my activity here at my home for the past week. I have a renewed interest in elevating my vegetable gardening skills to a higher level. I don’t just want to plant a garden, I now look forward to tending it lovingly as well. Last year was the first time I used an electric fence to keep the voracious deers from eating my food. It worked, and now that fence is serving its second season of duty. I have purchased a new hose to water my garden, as well as successfully employing a drip irrigation line to carry us through the dry days. We are limited to how much water I can draw from my dug well, so this week, I am setting up a system to collect rainwater off my roof where it can be stored in a large plastic tank and then gravity fed into the two plots below. I am a bit behind in the planting schedule. I was able to plant leeks, onions, tomatoes, kale, and some lettuce before I went a way to hike in Portugal and Spain for the month of June. It was unseasonably cold here when we were away, so both the vegetables and the weeds held back a bit until I returned. I had plenty of compost to apply, under the plants, that had aged nicely over the last year from inside my two plastic bins. Deer love lettuce, so I made a wire cage overlay to protect a small area of various leaf styles. In the space of a week, seeded plantings of beans, beets, carrots, Chinese cabbage, bok choi, and salad mix are out of the ground and greening up under the sun. My neighbor Bill had overflow plants from his own greenhouse that he shared with me: cabbage, Brussels sprouts, summer squash, and zucchini. I bought a few more plants to round out the garden choices: eggplants, broccoli, peppers, basil, parsley. Leeks, onions and lots of plastic bags. I have a new experiment going with my brassicas. I have been planting on this land for close to 40 years and in that time I have developed a serious problem with clubroot on my broccoli, cabbage, and Brussels sprouts plants. Clubroot is a soil born disease which causes grossly enlarged and malformed roots and stunted, sickly plants. The normal solution is to use a 4 year rotation for those vegetables along with treatment of the soil with lime, but it’s easier to read about this practice than carry it out. I am trying out a new idea. Home Depot had 40 pound bags of topsoil on sale for $1.58. I bought twenty bags. I planted a broccoli, cabbage, Brussels sprouts, and cauliflower seedling in each bag, which I perforated with 12 holes on the bottom. My reasoning is that the plastic bag will keep the disease away from the fresh soil in the bag and I should be growing and harvesting some serious greenage this season. 8 miles of movement, and it’s not just walking! I can attest from the aches and pains in my muscles that I am getting a practical “crossfit” experience in dealing with these two plots that are less than 100 feet away from my door. Now that the chickens have moved out , I also have a greenhouse on the south side of my garage that can carry another whole bevy of fall and early winter vegetables that I can establish. And there is that pine tree that I have to cut down that’s shading the greenhouse too much. And the grass needs cutting, and there is firewood to cut up from the six trees that Gary and I felled in May before I left to hike. There’s also the satisfaction and nutritional benefit of eating real food. I give way a bit of extras. And finally, I am most interested in planting Padron pepper seedlings in the greenhouse and enjoying the experience of roasting, salting and eating those delicious appetizers in a couple of months. Who would have predicted that this “back to the lander” from the 1970’s would be leaning on the most simple of actions to improve his quality of life ? Maine is the real deal. My sister-in-law, V-8 , occasionally sends nuggets of true wisdom my way. We followed one of her maxims on our last full day in Porto, Portugal. Our Brazilian peregrino pal Heleno was here for three days before he started walking the Camino. Before we parted company, he adorned our map with some must-do locations that we decided to check out today. First on the list was a visit to Bolhāo, Porto’s large open-air traditional market that opens at 8:30 AM. It was an easy uphill walk of a half-mile from the Yes! hostel. The market was loaded with vegetable farmers, grain vendors, florists, fishermen, butchers, wine and cheese merchants, as well as purveyors of traditional crafts and souvenirs. I have a favorite place in Porto! After doing a run through of the two story sprawling floor plan, we found a little café along the rows of booths where we sat and enjoyed our €.80 cafe con leches. Little free pastries came with our cups. I wandered off and bought Marcia a flower as part of our modest celebration of completing our Caminos. We also had a purpose here at the market. I have been disappointed about my lack of success in ordering a traditional Portuguese soup so I decided that we could make it ourselves. There was a well-appointed kitchen for resident use at the Yes! hostel where we are spending our last two nights. We fleshed out a traditional list of ingredients for the soup: potatoes, collard greens, onion, shelled beans, a tomato, local chourico, and garlic. Fresh bread rolls rounded out our list. I also purchased a bottle of white port from one of the vendors to bring home, plus three little bottles of various quality port wines to try out later today. Marcia was interested in the chickens, perhaps springing the cage? By this time, we were hungry for lunch and we just happened to be in the vicinity of the Majestic Café, one of the iconic establishments in Porto, and the second place recommended by Heleno. We were given a small table adjacent to the piano in the center of the large café. Check out the stunning website. This place is a gas. It truly was a special meal. Marcia wanted a gin and tonic. The stylishly uniformed waitress, who spoke English, asked Marcia what brand of gin she preferred. “ I’m OK with the house brand,” Marcia replied. “The waitress retorted, “We don’t have house brands here, but we do have anything you would like.” She steered Marcia to the Bombay Sapphire, and then brought back what appeared to be a stunning double. We were provided with a few tapas dishes to start our brunch. I had seafood soup and a chicken Caesar. Marcia preferred a seafood salad. All concerns about costs went out the window, to the tune of €78 for drinks and lunch. Other couples who sat around us were content with a couple coffees and their selfie shots, as they rolled their eyes at the menu. With two down, I had one more even to go today. We parted after the meal, with Marcia content to wander the shops on the Rua de Santa Catarina while I headed back to the hostel to drop off our purchases and then walk down some twisty steep streets to take in the third of Heleno’s recommendations, the WORLD OF DISCOVERIES, an interactive museum and “Theme Park” that re-enacts the adventures of Portuguese navigators as they crossed oceans to discover previously unknown worlds. Around 1500, Portugal played a leading role in this process, creating new maritime routes and circulating all around the world. At 14 Euros, the entrance fee is over priced. Billed as an interactive theme museum, it’s a bit weak, but my frame of reference is Disneyworld. I was able to get into the 4 pm English-guided option. There were two parts, billed as a 75 minute experience that stretched to an hour and three quarters due to a bit of waiting around. The story was narrated by on young bearded man who was dressed in period. There was considerable money and design to the place, which had replicas and some historical objects, as we were led through a half dozen rooms that were illustrated with standard mannequins and replicas. The data we were getting was not 100 percent. For example, I liked the part of the tour where we were shown models of the half dozen types of sailing vessels that cruised the seas in the late 1400s. When he replied, “ Ten to twelve,” every one of the four other guests looked as shocked as I was at what was obviously an incorrect figure. I knew that Columbus’ Santa Maria was the largest of his three ships and that was just under 20 meters (58 feet) long . A couple of folks even challenged him but he held firm. The boat trip was disappointing. The cheap headphone only produced sound out of one side, and that was poor quality. The audio portion was laggardly, with periods of silence that were too long as the boats weaved in and out of the different rooms of the voyage. The gift shop had the expected nautical puzzles, magnets, etc, but there were also some strange things offered for sale. When I was looking around there were many middle school aged students in the shop and they were tittering at something on one of the sales tables. After they moved on I went over to see that they had been checking out a box of embossed chocolates that depicted 12 Kama Sutra couples actually coupling. I did not check out the dining room, which received great reviews. So three events were enough for me today- almost. I’d call our supper collaboration a success as well. A good kitchen make it easy to whip up a good meal, this one with local ingredients that we purchased this morning for very low prices- 5 Euros or so. I did get my Portugese soup, on the last day. We had to come though, and we did, together. 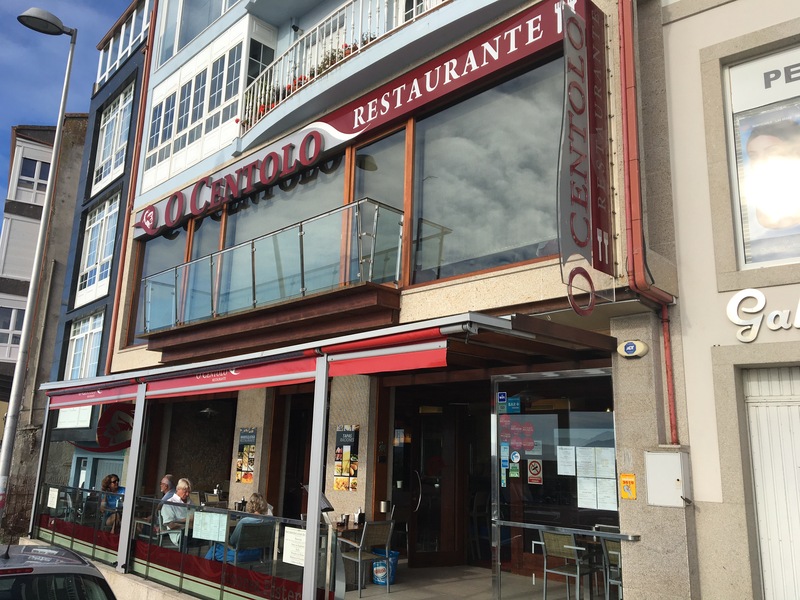 Multiple sources here in Finisterre pointed to O Centolo as the place that was still cooking up the authentic Galatian soup that I have been craving. Finding a place that cooks it here in summer is another story. We passed by the place on our mid day walk earlier today, where we looked through the glassed-in entrances to see people enjoying lunch at the far end of the large dining room. Both Marcia and I assured ourselves that in a few hours, we would arrive here early, in order to avoid yet another night of settling into bed after 10 PM with full stomachs. At 7 PM, with almost visible salvatory anticipation, we walked up the worn stone stairs to the O Centolo street entrance off the town Circle only to find the door still locked. 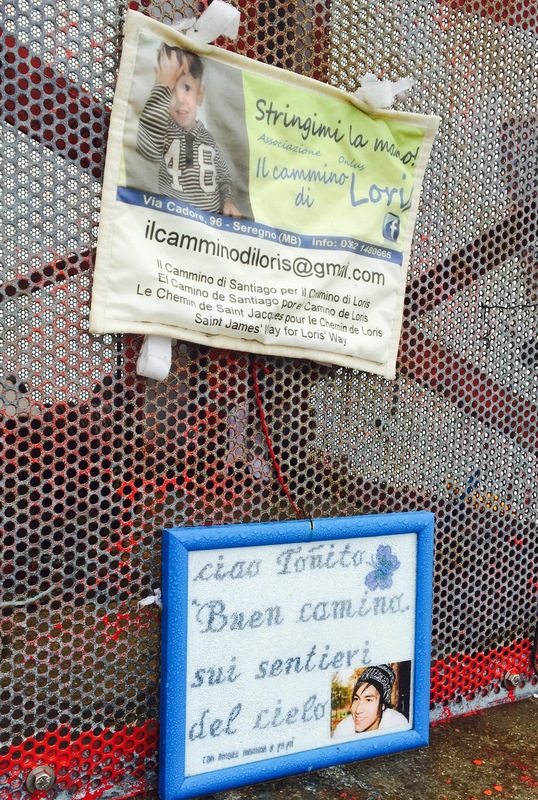 The evening’s special perigrino menu choices were freshly posted on the glass of the entrance. We were baffled, but conjured an explanation that any establishment at this level of gastronomy would likely fill, even if starting at 9 pm. Shops and restaurants close in the afternoon for siestas. People eat dinner late here. Plan B: we decided to march up to the grocery store where we purchased a €1 liter of local vino tinto and a small package of roasted cashews and returned to our room to leisurely pass the hour, with vivid pictures of that bowl of soup seeping into my consciousness. Then back up those same stone steps where the mahogany door was still locked and through the door glass, the large dining room was empty still. What? We definitely saw people eating here at lunchtime, however, there were no business hours posted anywhere on any of their printed material. With a heavy heart of hope wrung weak with disappointment, we trudged onward toward the shore of the harbor to comb the seafood establishments there for any semblance of the surprisingly elusive bowl. Then it happened! So quickly! We turned right along the road that ran between the harbor and the last row of building when I happened to look up and saw this incarnation of holiness, embodied in a red plastic sign! It was all there, my Galatian soup, our vino tinto, and a great atmosphere. Some chinks: our waiter initially claimed he spoke no English, but then returned to our table 10 minutes later to fluently explain that one of our main course choices was sold out. In a related aside, it is a given that local residents may not always be dependable sources of information. 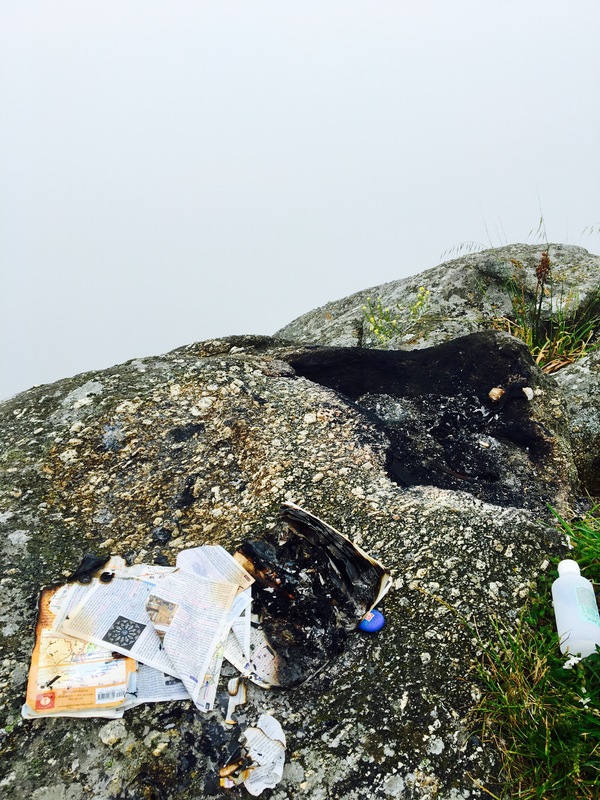 One of these grand disappointments happened yesterday in Finisterre. 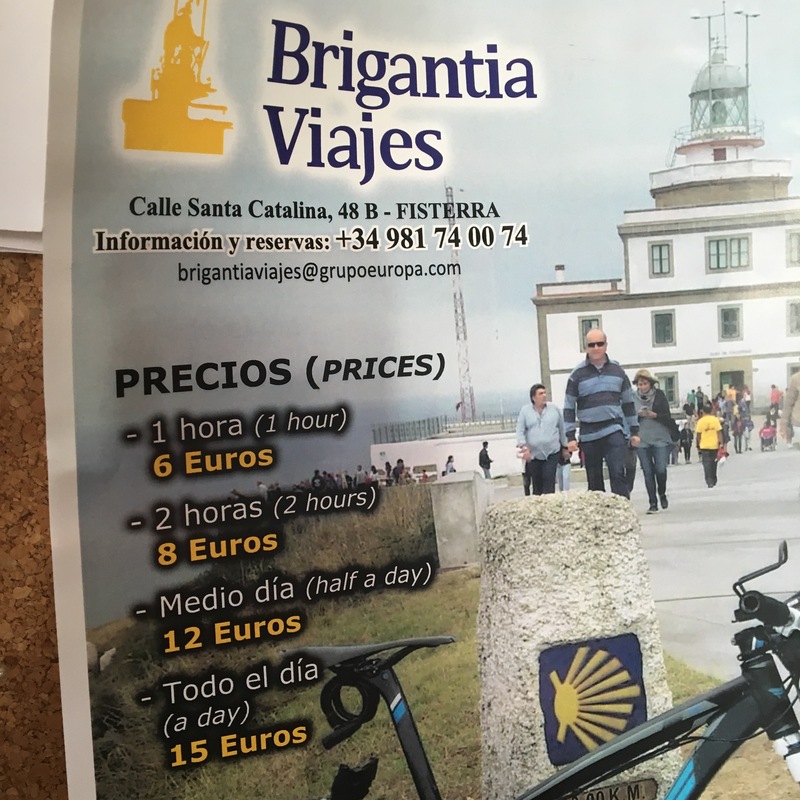 At a lunch spots where our waiter was one of numerous physically fit young Spanish men, I asked in Spanish, “Can I rent a bicycle in Finisterre?” He held up his finger and then went back and brought out a colleague who was fluent in English as well. Walking with your heart in your hand is serious business. 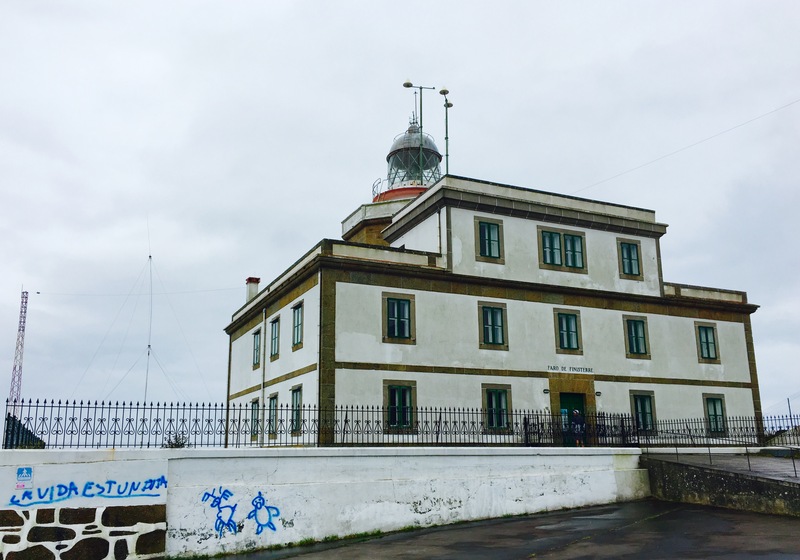 It felt like that this morning, on my solo hike from the seacoast town of Finisterre up the incline to one of the most spectacular lighthouses that I’ve seen along either coast of the Atlantic. Marcia was going to join me for the walk this morning but when it started to rain she decided to hold back and enjoy the private room and maybe read or shop a bit. I appreciated being alone for a couple of hours, being with my feelings about my journey on this last day of walking before we bus back to Santiago, Porto, and then home. It was good for me to cut back today. I am now in the habit of monitoring my recovery from exercise by taking a four minute sampling of my heart rate variability as soon as I wake up in the morning. It has been fine until yesterday, when I cut back a bit and today I planned to walk for just a couple of hours rather than most of the day, as we have been doing. Today, I was in need of even more rest and recovery. Unfortunately , I was unaware that it would be a tougher 6 miles than I expected. 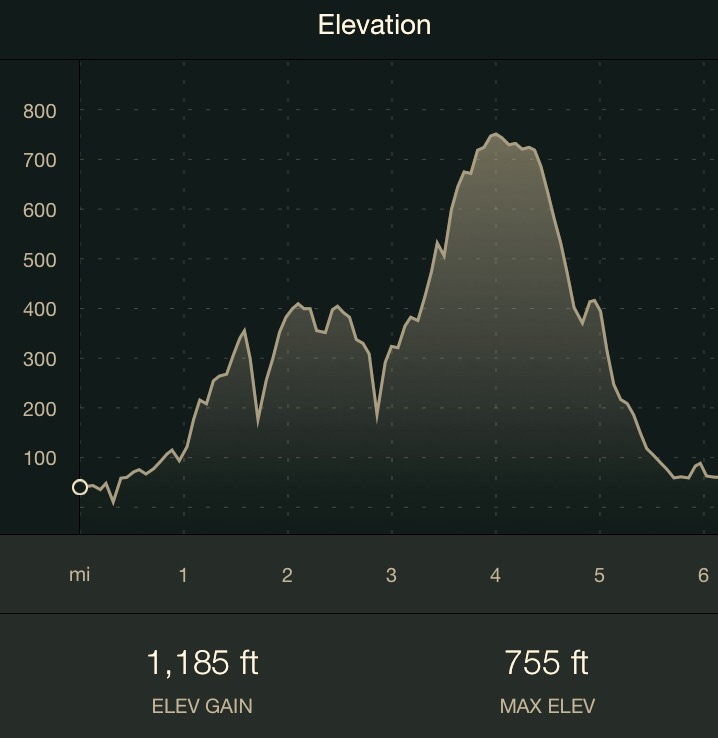 Here’s the elevation profile from Strava. 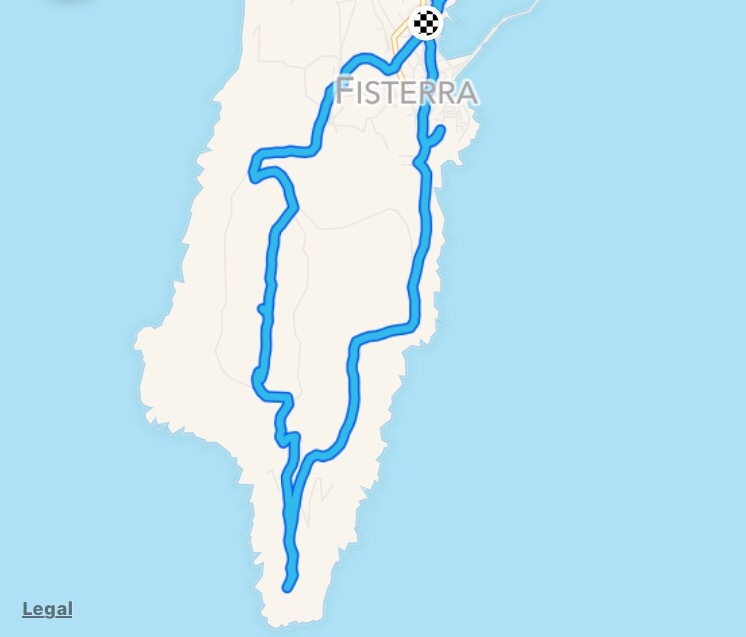 I ended up doing a loop, first climbing up the asphalt road along the shore to the lighthouse. There was not much to see today, although there were some breaks in the drizzle and fog. There were just a few people on top when I arrived. The usual top-of-the/mountain grot shops were just ramping up and a few tourists that drove up were grumbling about the fact that the bathrooms were still locked up. I walked past everyone and explored the path less traveled, as usual. Down below the lighthouse on the side facing the West were personal monuments that peregrinos had left behind, in their own frames of importance. Some shrines reflected losses of others. It is a tradition here to burn one’s worn and fetid clothing after a pilgrimage of hundreds of miles. Roasted underpants, however, are a bit much. There are charred maps as well, which I took to be acts of personal liberation, and intentions to walk a more genuine path through our futures. I decided to walk back through the woods. 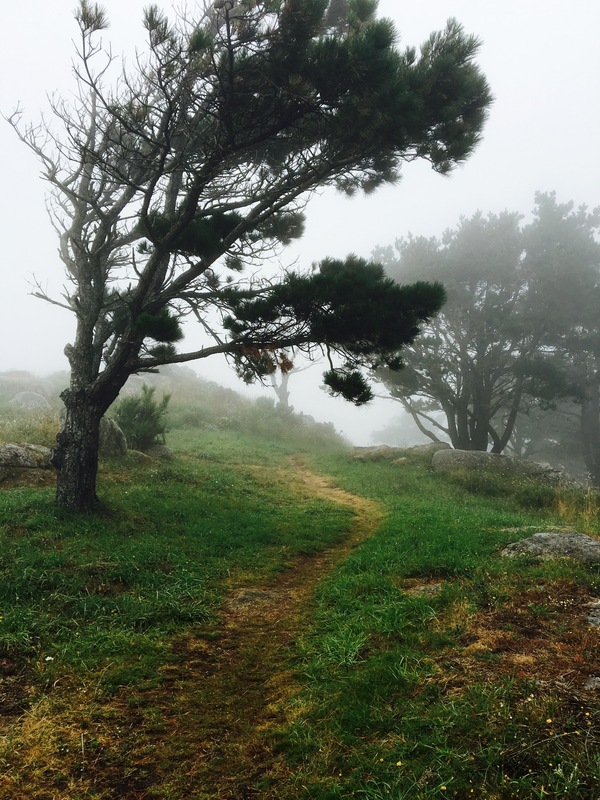 Despite my best intentions, with my Brierley map and my MAPS.ME app to guide me, I encountered an untrimmed , overgrown, and rain laden gorse of unkempt trails. At one time, well-intentioned individuals had erected signs that were now broken off at their bases, and tossed into the sea, no doubt. Brierley didn’t convey that this off-road path to spirituality was this hard to navigate. All the bare, rocky outcroppings looked the same. The neatly delineated and numbered religious sites in Brierley’s guidebook were now merging into an amorphous wildness. I kept moving in the right direction through the center of the peninsula. At one point, I looked back and saw a single figure walking behind me, looking as bewildered as I was. I stopped and waited to speak with him, not even knowing if that would be possible, given the disparate languages one encounters here along the path. It became easy, once the gentleman began to speak in English. He was one of a group of a dozen or so folks from the Cleveland (Ohio) Hiking Club, several of which Marcia and I encountered a few days ago on the Camino between Santiago and here. 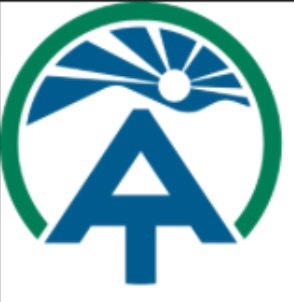 Then I spotted his cap, who in was adorned with the new Appalachian Trail logo, which bears quite a resemblance to the scallop-rayed Camino symbol. If turns out that this was a hiker who completed 1100 miles on the AT, including half of the 270 or so miles in my home state of Maine. 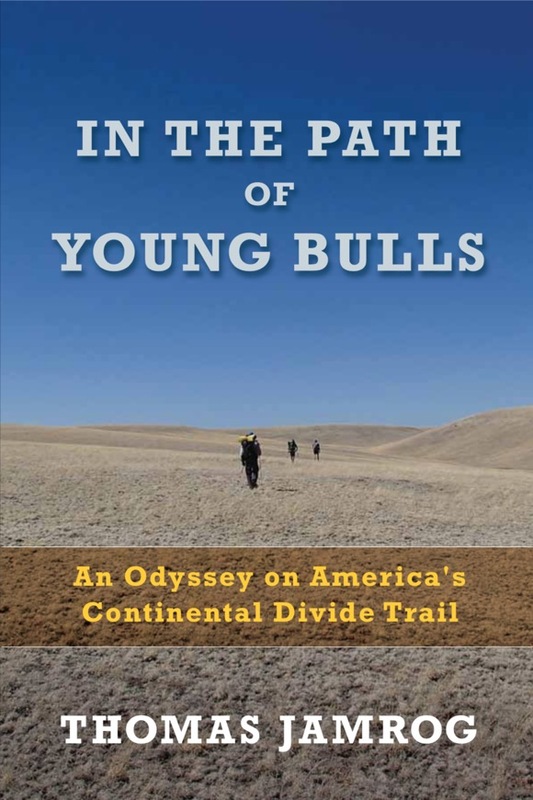 We shared our trail names, as well as the fact that both Tick Magnet (his trail name) and I also share the experience of Lyme disease. We also shared the challenge of finding our way back to our respective hotel and albergue, with Tick Magnet thanking me for eventually guiding him back to safety. 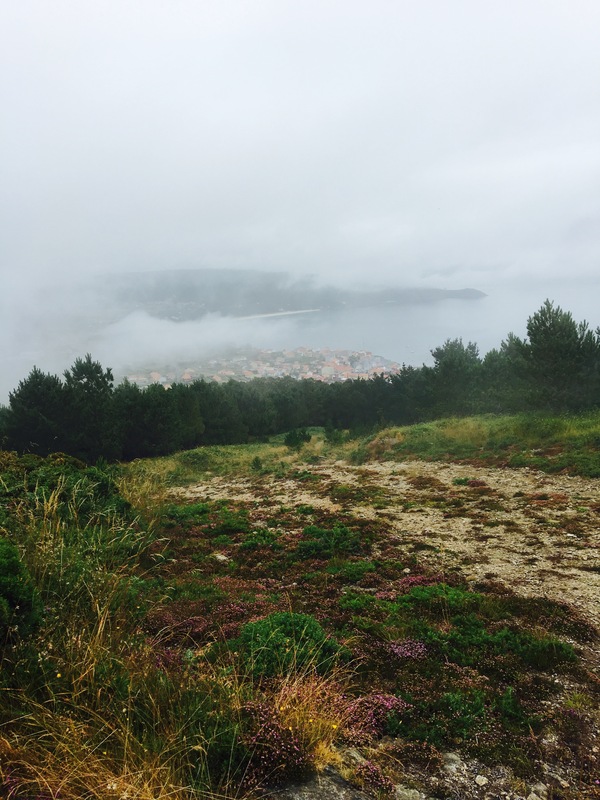 With the thick fog, indistinct trail, lack of signage, and him without any compass or gps, Tick Magnet ascertained that he would have in all likelihood been walking for hours in the direction of Cee, and not Finisterre. It’s so different here. Take the options for rehydrating, for example. 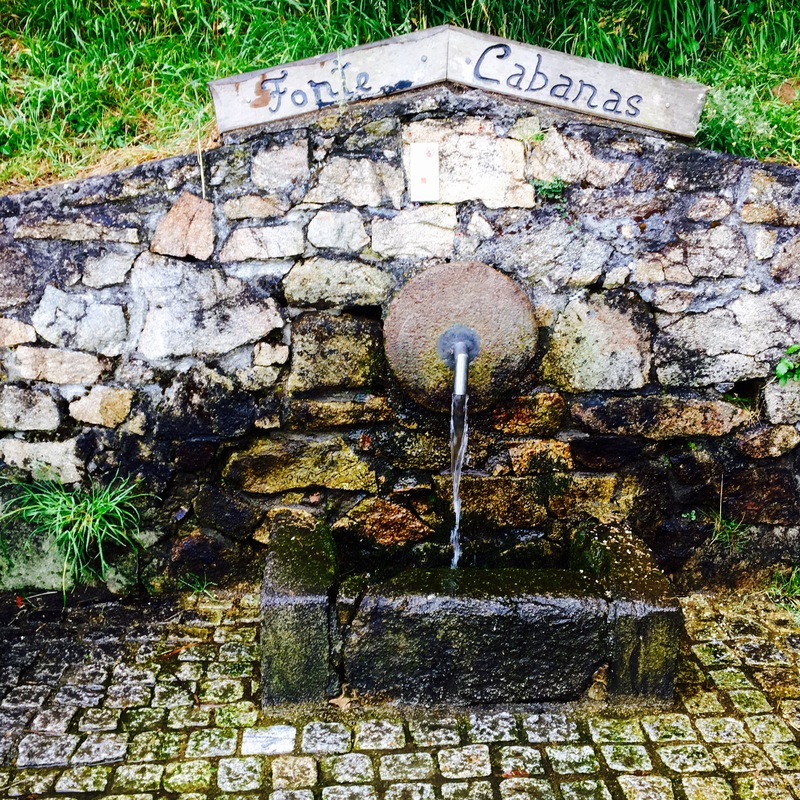 It has been my practice to carry little or no water on the Camino, due to the frequent ancient sources like this one, half way up today’s big hill. A little further up I hydrated with wine that I found left at a picnic table. 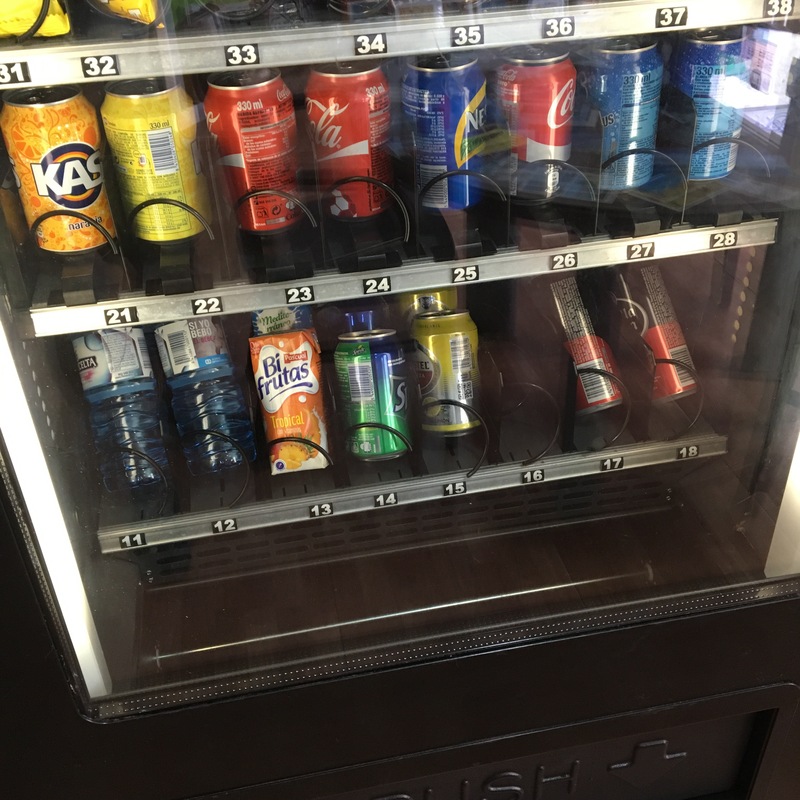 When I got back to the Cabo de Vila, our most excellent private alberge, I popped a Euro coin into the vending machine and relaxed with a cold beer. 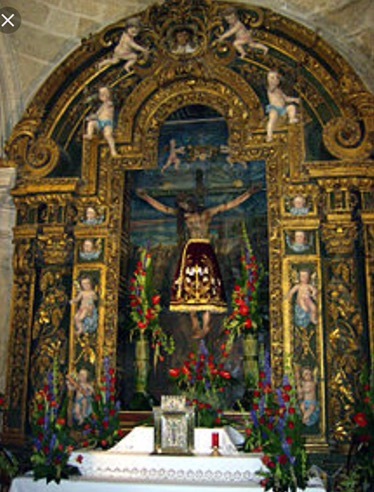 I visited the Church de Santa María das Areas twice today, however it remained locked all day. I had even been assured by the owner of our albergue that it would definitely open at noon. This church was initially built in the 12th century, with new elements being later added, particularly during the 14th and 16th centuries, to make up its present day structure, a mixture of Romanesque and Gothic styles. 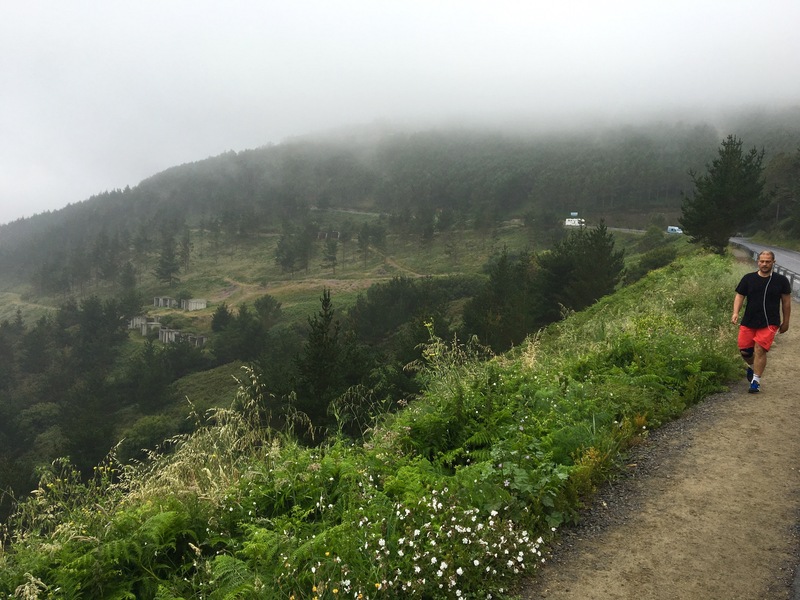 My experience of Finisterre us that is is a bit oversold, at least by Brierley, who was the only guide I had. Finisterre reminds me of another seacoast port way over on the other side of the Atlantic named New Bedford in Massachusetts. It is nowhere near as old, but was settled by Portugese who came there first from the trade routes from Europe, and then the whaling epoch. It is a seafaring town, with a strong Catholic history, a bit battered and worn but a city with very hard working people who have also been through hell to get and to stay there.